50 year-old woman who has experienced knee pain in her left knee for several years states that the knee becomes swollen at various times without apparent reason. She describes the location of the pain as "deep in joint," explaining the discomfort felt is not exacerbated by personal or environmentally-oriented factors, such as diet, exercise, weather conditions, etc. Neither a smoker nor user of alcoholic beverages, she says the pain responds well to anti-inflammatory medications. Discussion: Calcium Pyrophosphate Dihydrate, commonly called "pseudo gout" or "chondrocalcinosis," will cause soreness and swelling in one or more joints as otherwise healthy cartilage tissues become weakened by these tiny crystal deposits. Inflammation is an exterior skin reaction to the body's immune system attacking these formations. Formation of CPDC deposits may result from abnormalities in the cartilage cells or connective tissue, and may be an inherited genetic deficiency. Movement of CPPD crystals within joints can cause sudden and severe pain accompanied by reddening of the surrounding skin area, a feeling of warmth and slight to moderate swelling. Unchecked, the deposits will ultimately cause severe pain by destroying the cushioning of cartilage tissue that prevents bones from rubbing directly against each other. A severe condition can lead to total knee replacement. The key to accurate diagnosis requires a detailed medical history and aspiration of the afflicted joint area to determine if CPDC deposits exist. X-rays may be required to confirm the initial diagnostic procedure. Blood tests are normally taken to eliminate potential sources for discomfort that may also indicate traditional gout, rheumatoid arthritis or osteoarthritis. 4. Fluid and/or crystal removal. 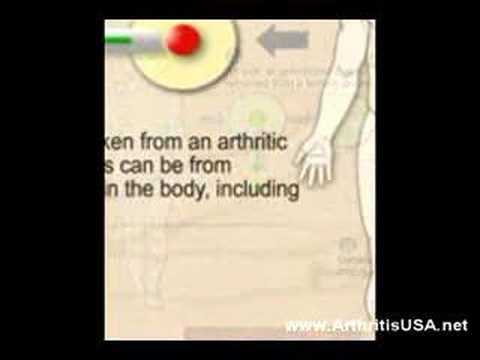 How does Applications of Stem Cells help Arthritis?